Toe touching exercises require good flexibility. Touching your toes is normally quite easy. Just sit down, prop up your foot and there you are. 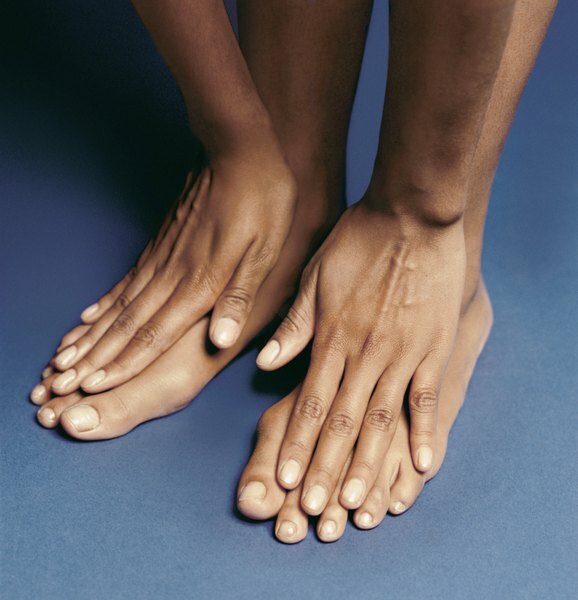 But touching your toes while you’re standing with your legs straight is far more challenging -- and that’s why toe touches can be a helpful exercise. Depending on how you perform the exercise, toe touches can stretch your hamstrings, work your shoulders or exercise your hips and lower back. Just make sure you’re sufficiently flexible to perform your chosen exercise. Stand erect with your hands at your sides. Make sure your knees are straight. Bend forward from the waist and let your arms fall straight down from your shoulders. Continue bending until you can reach down and touch your toes. Hold the stretch for 10 to 20 seconds. Don’t bounce up and down. Stand erect and spread your feet wider than shoulder-width apart. Extend your arms straight to your sides at shoulder height. Bend forward from the waist and rotate your upper body to the right while you keep your arms and legs straight. Maintain a straight back as you bend forward until your torso is parallel with the floor. Continue rotating to the right until you can touch your left foot with your right hand. Return to the starting position, then repeat the exercise to the opposite side to complete one repetition. Perform 12 reps. Stand erect with your feet wider than shoulder-width apart and angled a bit to your sides. Hold a dumbbell in your right hand and extend your right arm straight up from your shoulder. Let your left arm hang naturally at your side. Bend forward from the waist, rotate your torso and reach down with your left arm until you can touch the toes of your right foot. 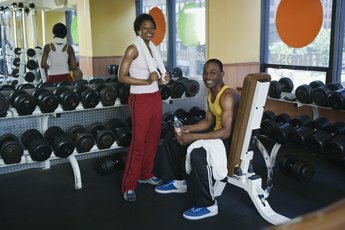 Keep your legs and your right arm straight and maintain the dumbbell’s position. Return to the starting position to complete one repetition. Perform five reps to each side. Performing standing toe touches with your legs straight puts stress on your lower back and hamstrings. If you try a standing toe touch, remain alert for any discomfort in your back or the backs of your thighs. Consult medical personnel or a trainer if you’re in doubt about whether to perform standing toe touches.